Principal Cast : Ben Affleck, Oscar Isaac, Charlie Hunnam, Garret Hedlund, Pedro Pascal, Adria Arjona, Reynaldo Gallegos, Madeline Wary. 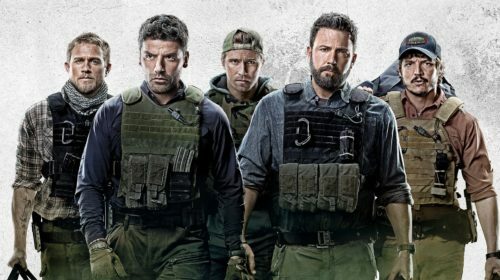 Synopsis: Loyalties are tested when five former special forces operatives reunite to steal a drug lord’s fortune, unleashing a chain of unintended consequences. 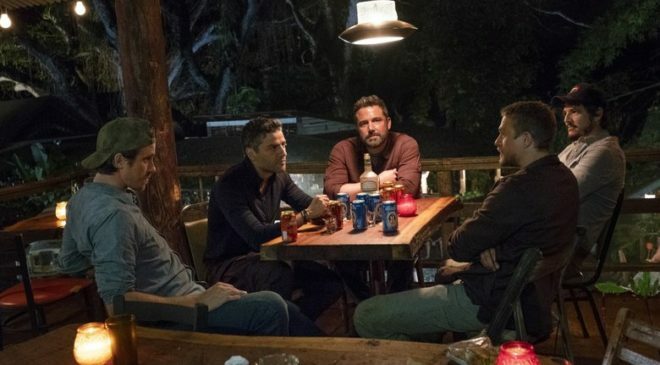 Boasting a pretty hefty cast, a terrific location in which to tell its story, and a solid director behind the camera, the Ben Affleck-starring Triple Frontier ought to have been a lock for one of the better highbrow action films of the year. 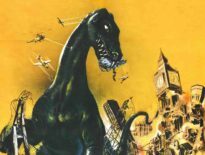 Ought to have been, for as much as the film has some surprisingly raw and effective action sequences, is isn’t successful in being either action-y enough to qualify as a legit action film, nor smart enough to maintain any kind of intellectual equilibrium to go with its diffuse moral quandary theme. Director JC Chandor re-teams with A Most Violent Year star Oscar Isaac in this militaristic “last mission” cliche film that mines low-key thrills from its epic, widescreen setting and conceit, wasting a great cast on material that feels too disingenuous with the statements it makes. A former Army Special Forces team regathers years after disbanding to take down a violent South American druglord and crime boss, Lorea (Reynaldo Gallegos). 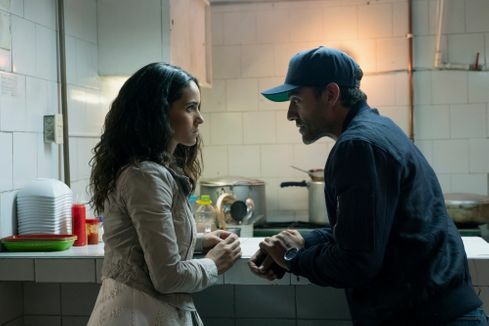 Santiago “Pope” Garcia (Isaac) works as a contractor for Colombian intelligence combating drug crime, and has been hunting Lorea for years, and, thanks to a mole planted within Lorea’s organisation (Adria Arjona), has discovered a hidden jungle hideout where the crime boss has hidden his vast ill-gotten fortune. He recruits former team leader Tom “Redfly” Davis (Affleck), brothers William and Ben Miller (Charlie Hunnam and Garret Hedlund), and pilot Francisco “Catfish” Morales (Pedro Pascal) to work as a team to recon the hideaway, and eventually plunder it for themselves, ridding the world of a heinous monster but salvaging a fortune along the way. Unfortunately, as with the best laid plans, things go wrong, and the team are forced to make an escape across dangerous and hostile South American landscapes to safety, all whilst being pursued by Lorea’s men. 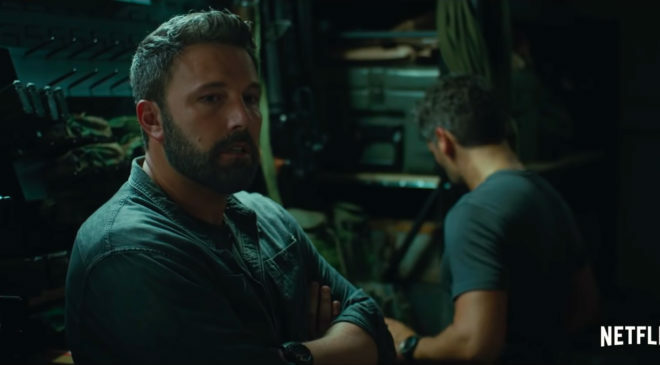 Mixing one part “Boys own adventure”, a load of every secret mission cliche you can think of, and a tone that comes a little too close to Antoine Fuqua’s Tears of The Sun, Chandor’s Triple Frontier (a reference to the region where the borders of Peru, Colombia and Brazil meet) offers plenty of gritty violence and hoo-rah testosterone for a willing audience, but the film fails to be dumb enough to cater to the back row or smart enough to remain edifying for people hoping to at least find brains within the script’s superficial moralising. It’s a bewildering mixture of quest narrative, survivalist thriller and militaristic jingoism, absolutely none of which make for a compelling film either together or separately. The screenplay (credited to Chandor and two-time Oscar-winning screenwriter Mark Boal) doesn’t click like it ought: the central characters are a mix of parody and cliche, from Ben Affleck’s puffy-eyed former team captain turned middling realtor, to the Hunnam/Hedlund brotherhood double act and Pedro Pascal’s matchstick-chewing tag-along, with only Oscar Isaac’s Garcia offering anything even remotely resembling an arc within the larger context of the story – his relationship with beautiful mole Yovanna, forms the basis for his entire motivation in the mission (mostly), even if it’s generally handled with disinterest by Chandor’s unwillingness to commit to the subplot. The dialogue would be risible if it was uttered by actors of a calibre beneath Affleck and Isaac (Hedlund and Hunnam are both outclassed by the film’s subtleties, but they make a solid fist of brooding, hulking physicality throughout) and in truth the actors largely salvage a relatively pedestrian outing for all involved. The mission set-up, the square-jawed machismo of the team in action, and the resolute simplicity and straightforwardness with which they carry out the insertion and extraction, is well executed (pun intended) by the filmmakers, but it’s when things go south and the plot turns into a survivalist escape adventure that the movie turns into a slog. A mid-film lurch to the left like this hasn’t been successful since From Dusk Til Dawn – I’m not saying there’s vampires in this thing, but the jarring turn from well-oiled machine to what the film becomes seems a little far-fetched, IMO – and Chandor isn’t able to mix the pathos and pure human drama the script inspires with the bloody and shocking violence the characters endure and deliver with any real sense of balance. It’s an uneven affair, this one. The crux of my problems with it lies in the ineffective character development afforded to the ensemble early in the movie. 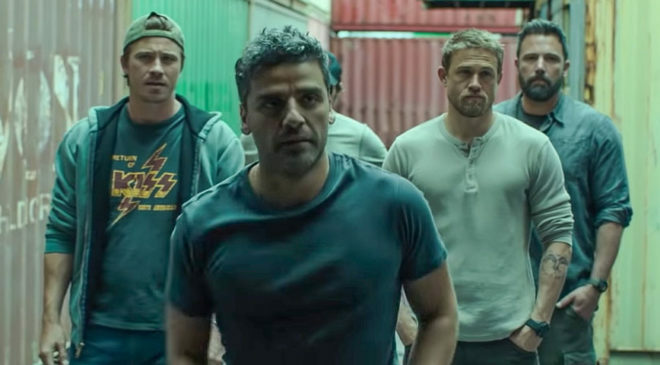 These people are, by and large, generally unlikeable to a point, a bunch of tough guys trashing glory and honour for what is essentially a glorified tropical Ocean’s 11 robbery, and because they aren’t well defined outside of stock action cliches, the film’s attempt to humanise them later on flails about poorly. 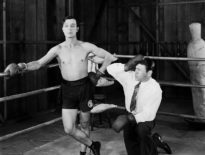 Sporadic and violent action, too many faceless combatants and an insufficient sense of tension spoil this already predictable affair and prevent it from achieving loftier goals. Low-fi action antics and B-grade scripting, albeit aided by Affleck and Isaac’s terrific buddy-buddy screen charisma, make for a middling pulp outing that looks classy, feels well produced (and seriously, the Hawaiian and Colombian jungles used for filming are a canvas not to be missed, and Chandor to his credit makes great use of the stunning South American landscapes) but ultimately underwhelming. Better characters or a focus on actually being an action film first and foremost may have helped things, but it’s hard to see beneath the grim, gritty tableau presented here.